On New Years Eve, we are attending a Masquerade at our favorite local goth/fetish club, Fallout. I can either never afford the masks I love or never find an inexpensive one that fits my face correctly, so I'm determined to make one myself. With the help of my friend Bailey, we were able to make a plaster mask on my face that will work great as a base. It's a mask for the top half (nose and above) of my face. It was messy to make, but fun and quick. That was the easy part, the hard part is designing the rest of the mask. I wanted to do a Sugar skull mask, but now I think that might not work with my dress. My dress is black bias cut rayon with black lace insets. It's long and beautiful. I have lots of supplies I can work with...feathers, artificial flower petals, sequins, beads, various fabric, ribbon, wire, chain, etc. All the normal stuff for mask making (and other crafts, since is the 1st mask I've made). I just have to decide on a design. Here is some inspiration that I will be using to design my mask. Should you want to learn to make the below mask, there are instructions at Instructables. 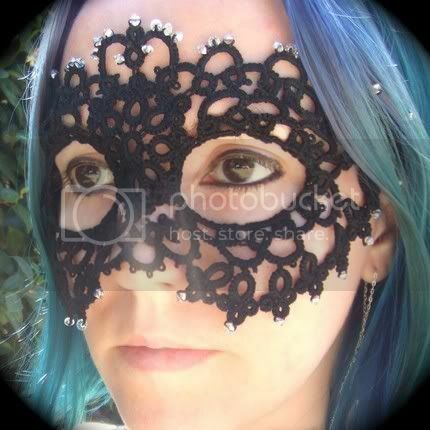 This is an Venetian style mask. I like the asymmetrical design. I love the balance the details have. This is most likely what mine will end up looking like. Instead of the jeweled leaves, I might add feathers, but I am able to make those leaves too. Instead of the hanging beads, I can do black draped chains. Hmmm decisions, decisions... 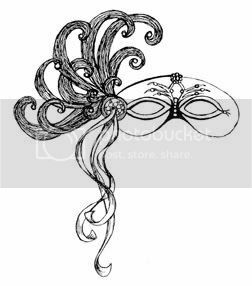 This site also has many other beautiful masks to choose from. I have always wanted to tatt and still have not learned how. I see you made this awesome tatted mask with a needle and I haven't had a chance yet to see how it's done....I'm excited to check it out though, the mask is so beautiful! I didn't make any of the masks above. They were just inspiration to make one. I don't know how to tat, though I would love to learn. I linked to the instructions that the creator of the tatted mask, made.